here i sit in the living room by the long windows which are still shuttered. this library of a living room with one wall lined with old books and the other with oval mirrors. resting here in the quiet of the venetian morning with small lamps casting a warm glow across the room. outside gulls are crying and swooping. the white radiator against the wall is murmuring. a boat goes by the water slaps against the canal. soon i will open the windows. the day will start. but not yet. this is the entrance to our ground floor flat. i will share the link when i return home. it is a fine apartment, inexpensive and good for 3 travelers. the internet is faster in the morning. so here i am with another dispatch. yesterday we roamed dorsoduro and san polo, san croce. to frari church and la scuola grande di san rocco to behold tintoretto’s “sistine chapel”. a quiet day of meandering back streets and passageways, over bridges where canals meet. past shoppers and old women in fur coats wrapped against the cold. narrow canals catching light from a sky and windows that cast down light onto the pale green water. dark lanes opening to bright campos. it is a pleasure to stroll. 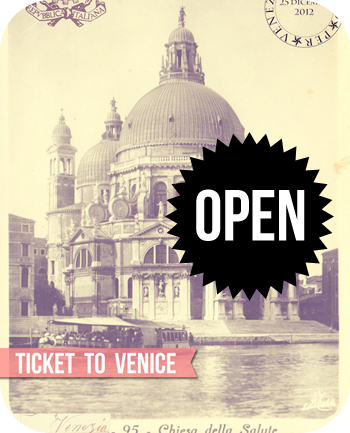 surely one as keen as any that venice can offer. one curious thrill after another. i have made almost no pictures in the small notebook i brought. but am writing, notes, and cutting and pasting onto the pages. scraps i collect during the day. i didn’t bring the massive travel journal i had planned. wanted a small notebook that can take a beating in my bag. i may have something to show when i return or i may not. it’s a huge job to create an illustrated travel journal in 12 days or so and on this trip i am too busy reading and wandering, visiting with christy and dottie, eating fava bean stew around our kitchen table in the evenings. dottie made squares of polenta, good to spoon the stew on top and eat! drinking coffee. a tower of books on my bedside table. the first travel i’ve done where my nights are not busy with capturing the day in ink and paint. it’s been awhile since i blogged on location so THIS is my travel journal. just this. and for now it feels like enough. we stopped for a sicilian cannoli. chocolate citrus ricotta confection. eye-crossingly good. and now i finish my early morning dispatch. open the shutters. start the day. where will we go? i don’t know, but if you’re game, i’ll carry you along. Mary Ann….a lovely stroll with an amazing artist…Grazie!! Hi! Looks amazing. Your photographs are wonderful. I love the detail of everything you’ve captured. The descriptions are great. Enjoy all of it! Thank you so much for sharing this adventure. Hi! Looks amazing. Your photographs are wonderful. I love the detail of everything you’ve captured. Enjoy all of it! Thank you so much for sharing this adventure. Beautiful photos! I am loving this tour. Oh lovely! One of my favorite things is the video you made on your last trip to Venice. When I think of all the places I want to travel to, Venice is on the list because of your video and description of your arrival in the dark. I love seeing these photos. Do you mind my asking, what camera are you taking on your travels these days? We were in Venice in Oct, and loved it. What we really enjoyed were all those special little details, and it’s so much fun to see what caught your eye. Spot on! Thank you for sharing your photos and impressions! Ahhhh the panettone! Did someone say toasted? I MUST have some! Looks like you are having fun sisters… and the weather looks perfect. I find that at the beginning of a trip, I’m so fired up with enthusiasm that THIS will be trip that I finally journal it and draw it and collage it all perfectly. Hasn’t happened yet. 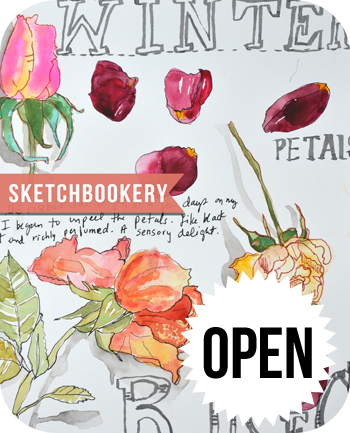 There is a huge joy to making an art journal on a trip but, it has to be admitted, something of a relief to realize you don’t ‘have’ to. You be you. I just got back from two weeks in the UK a week ago today; the Christmas markets, the total lack of other tourists at castles and other touristy sites….there is much to be said for Europe in winter! I took photos of so many bell pulls and doors when I was in Italy (including Venice). I love the old money elegance to everything there. You can really see how it was its own nation back in the 1500’s when all trade came from the east to the west through Venice. I hope you don’t mind if I attempt to sketch one of your photos, with credit of course. the art…take it all in with your senses. Sounds to me that that is exactly your aim. What a treat to secretly observe Venice cold, quiet, and tastefully dressed for Christmas. Best Christmas card ever! Ahhh, your photos take me back to my (brief) time in Venice. All the textures and colors! I especially like the reflections on water. Your descriptive writing is captivating. Definitely take us all along in your pocket. Thank you. Thank you for once again taking us with you on your adventure. The photos are a wonderful “travel journal”. Panettone!!! Sliced thick, toasted, buttered. My morning is made. I am game, carry me along so I can immerse myself in memories and delight. I am loving the photo’s and your thoughts. Thank you so much.